Can anyone in the world make sense of what we are seeing? A group of nations working together carrying out the most unusual policies mixed with lies. Enough to drive any normal reasonable person insane trying to figure out the logic. What logic? I'm talking about trying to make sense of the western mainstream media logic (of ISIS terrorism and Muslim fundamental terrorism being so dangerous to Israel and the U.S.) in conjunction with what we actually see happening. Things like Israel and CIA (and Turkey) working with Al Qaeda, Al Nusra, and ISIS- arming, funding and training them. Things like Israel attacking only the enemies of ISIS and Al Qaeda. 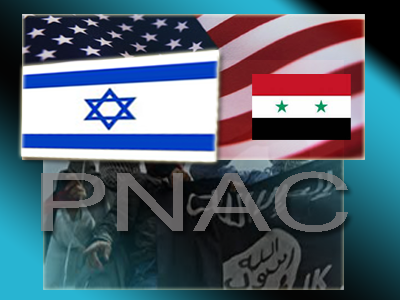 Things like Israel attacking the sovereign nation of Syria instead of ISIS itself declared by the U.S. government and mainstream media as so dangerous that congress voted for funding war against them. Whatever happened to ISIS being so dangerous? Wasn't ISIS supposed to be the greatest threat to the Middle East and the world because they supposedly have members joining from all over the world? Wasn't ISIS the most sophisticated terror group that needed to be stopped at all cost because they were beheading Christians and took over Mosul overpowering 30,000 troops in one day? Despite all the mainstream media portrayal of ISIS as the dangerous Christian-beheading haters, and haters of U.S./Israeli (recall the James Foley beheading video) and all western culture, despite all of this, the relationship between Israel and ISIS is mysteriously peaceful and flawless. In fact when Israeli media reported the supposed arresting of an ISIS terrorist not long ago, even the supposed ISIS terrorist was given a soft sentence of 22 months in jail. Isn't this a bit odd for a terrorist member of a group that beheads Christians and is supposed to be the most dangerous and sophisticated terror group in the world?? Or is terrorism not that serious a charge in Israel? This is not the first time that supposed dangerous terrorists spent time in Israel jail before being set free to rejoin supposed terror groups who are dangerous threats to Israel. Al-Arouri is the supposed Hamas confession guy who after Israeli police concluded that the 3 murdered Israeli teens, who's murder was used as the sole justification to launching military attacks against the people of Gaza, were not murdered by members of Hamas- Al-Arouri would later present himself as a leader of Hamas and issue a "confession" that indeed Hamas was behind the murder of the teens. This "confession" of course, would be disputed by other members of Hamas and would contradict the factual findings by their very own Israeli police. Conveniently, Mr Al-Arouri's testimony would benefit Israel greatly by giving Israel a pretext for rationalizing their war crimes against the people of Gaza. Should it surprise us that this same supposedly dangerous Hamas "terrorist" spent time in Israel prison years prior for the crime of "terrorism" while being eventually let out of prison to carry on with his life? His life apparently includes returning to Hamas to be a dangerous terrorist and, while he's at it, aiding Israel in the process? What's going on here is obvious to anyone paying attention. These are fake pick-your-boogie-monster games where only a specific terror group is useful for political reasons. It's important that ISIS is a threat only to the U.S. somehow while somehow not posing a threat to Israel. In this new world order long term Middle East script it is important that the democratically elected government of Hamas is portrayed as a threat to Israel ONLY, and no one else, while ISIS is only a threat to the U.S. despite that fact that it's all the way on the other side of the world. Sounds crazy? In fact in one article from Gatestone Institute, writer Alan Dershowitz actually says it- "ISIS is to America as Hamas is to Israel". This is the perfect propaganda script for the U.S.-Israeli empire to implement their Middle East plans. A plan where super dangerous terror groups (or sovereign nations accused of being dangerous terrorists) only attack the specific countries required for them to fit into the Middle East and PNAC plans and no one else. How convenient huh? 1. Periods of silence (like we're seeing now) involving less talk about ISIS to get everyone's mind off of ISIS for a while. These periods of non-ISIS talk will buy ISIS more time to exist and slowly these periods will get longer. This will condition ISIS into the minds of the blind sheep who by now have fully integrated ISIS into their subconscious. The average sheeple right now couldn't imagine a world without ISIS even if they tried. That's how deep mass hypnosis works BTW. 2. Another tactic to be used to prolong the existence of ISIS is making them seem like they are always growing and recruiting. Notice how often media focuses on ISIS 'recruiting' stories? It's not enough that ISIS can take on multiple countries in battle on multiple global fronts while sustaining themselves militarily and with crucial daily supplies, but they also have time to take off from their incredible video production and internet social media skills to launch a worldwide recruiting campaign. All of this while they fight in multiple global fronts ... while winning! 3. Thirdly ISIS will be prolonged by the convenience of not being taken out by any of the militarily powerful nations who can take them down including U.S., Israel, Saudi Arabia, Turkey and others who could easily eliminate ISIS in a day or two, especially if they worked together. This shocking none-willingness to attack and eliminate ISIS (which might be the greatest story) is what we are seeing from not just the U.S. but now blatantly from Israel. Israel, like they did with Gaza, is caught blatantly choosing to attack a sovereign nation (of Syria) instead of focusing their energy to attack global terrorism. Once again critical thinkers, activists, and independent minded individuals are left baffled at the contradictions of narratives coming out of western (Zionist controlled) mainstream media, and the actions of Israel and the U.S..
Will there ever come a day when we all say enough? A day when enough of us say enough? Will Israel continue to get away with war crimes forever? Will anyone ever confront the political leaders of Israel and try them for war crimes? Benjamin Netanyahu is a proven and known political war criminal so why isn't anyone doing anything about it? Will modern day America ever come to grips with these war crimes perpetrated on Sovereign nations and clear violations of the Geneva Conventions? Will this western Zionist controlled mainstream media control the narrative forever? Must we live in hypnosis forever or will we ever mount the courage to see things as they are? Is the Orwellian spell forever or is there a mathematical chance of humanity waking up? How can we characterize all of this? All of this is explained by propaganda. A simple research on the meaning of propaganda will help solve and answer all of these questions. It's time for the world to wake up and see that Israel (like their U.S. partners) works with Al Qaeda and ISIS not against them. They would rather arm themselves and put the lives of their soldiers at risk to fight a sovereign nation like Syria who is in the way of their long term Middle East plans. As for ISIS and Al Qaeda and other terror groups, Israel has played a major role in the creation, operation and/or support of these organizations from day one. It's time for Americans to see the U.S.-Israeli relationship for what it is. This goes back to before 9/11 and even before the PNAC plans. The Israel factor can no longer be ignored. It's staring us all in the face and this latest and most recent attack on Syrian air bases and "targets" is just a continuation of the Middle East takeover which is a precursor to the global takeover, the new world order global takeover. We cannot continue to ignore these huge landmark historic points in the advancement of the new world order AND expect to stop the new world order from coming to fruition.